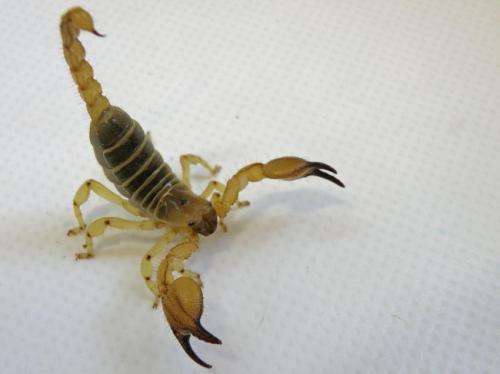 The researchers, represented by Dr Amanda Adams (Ben-Gurion University of the Negev, Israel), investigated the burrows of wild Large-Clawed Scorpions (Scorpio maurus palmatus) in the Negev Desert of Israel. After trapping the scorpions, they prepared replica casts of their burrows by filling them with molten aluminium. Once the casts had solidified, they were then dug out to be analysed by a 3D laser scanner and computer software. Rather than being simple holes in the ground, it was found that the burrows followed a very sophisticated design. 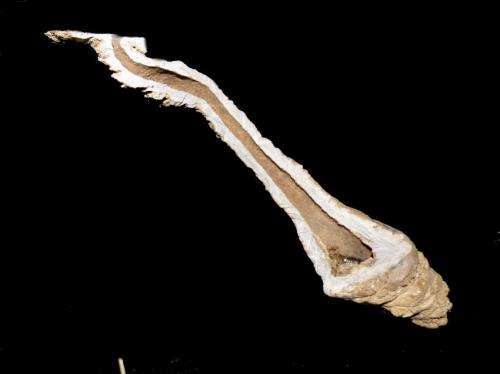 Each burrow began with a short, vertical entrance shaft that flattened out a few centimetres below the surface into a horizontal platform. The researchers believe that this provides a safe, warm place for the scorpions to increase their body temperature before they leave the burrow to forage at night. As ectothermic animals, scorpions rely on energy from the environment to regulate their internal temperature. The burrows then turn sharply downwards, descending further below ground to form a dead-ended chamber. Being cool and humid, this chamber provides a refuge for the scorpions to rest during the heat of the day, where evaporative water loss is minimal. As the design was common to all the burrows studied, this suggests that burrow building in scorpions has evolved by natural selection to meet the animals' physiological needs. "Very little is known about burrow environments" says Dr Adams. "We plan to expand our studies to more scorpion species around the world to test how burrow structure is shaped to be part of the burrow builder's extended physiology." Understanding the relationship between environmental conditions and burrow structures, meanwhile, could help to predict how burrow-builders will respond to climate change. This work is to be presented at the Society for Experimental Biology Annual Meeting 2014 in Manchester on Thursday 3rd July.